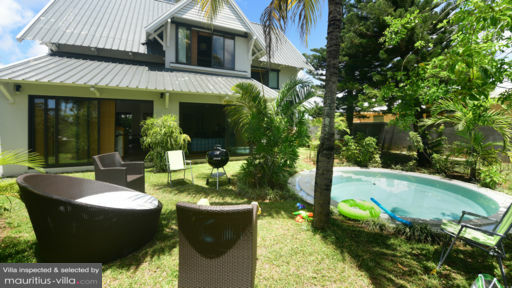 Located in the sunny village of Pointe d’Esny, Beau Séjour is perfectly decked out to offer a memorable holiday in Mauritius. With a stay in this villa, you will be able to relish in an assortment of services designed to render your stay even more enjoyable. This villa is nestled in the midst of a lush green garden, perfect for catching some rays. 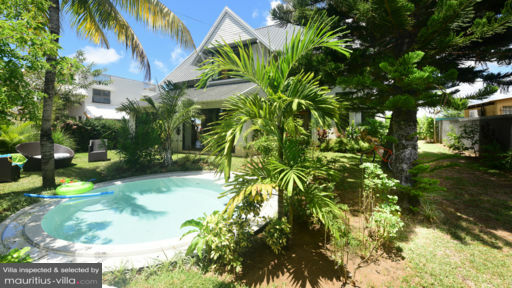 With a stay at Beau Séjour, you can take your pick from a total of five bedrooms that can accommodate up to 15 persons. The master bedroom has its own en-suite bathroom, perfect for unwinding at the end of the day. All the bedrooms feature bedside sockets and air-conditioning units so you can sleep comfortably during those warmer summer months. Upon request, it is possible to add five extra beds to the villa in order to accommodate any extra guests you may wish to have over. With a stay at Beau Séjour, you can revel in plenty of outdoor space where you can kick back and relax at the end of the day. In fact, you will find an outdoor dining area where you can savour a meal by the moonlight, Al Fresco style. After you wake up, kick back on the outdoor sofa with a freshly brewed cup of coffee as you breathe in the crisp morning air from the sheltered terrace. Best of all, barbecue facilities are available, should you want to grill up a storm with your loved ones. And if you want to cool off after a full day of exploring Mauritius, rest assured that Beau Séjour does come with its own private pool where you can work on your laps or simply float comfortably on the water as you gaze up at the unblemished blue sky. Big space to add beds if required. Spacious, comfortable and beautifully-furnished, there’s no denying that the living areas of Beau Séjour are aptly appointed to accommodate you on those days when you don’t feel like heading out. Catch up with your favourite show on the flat-screen television in the living room, complete with satellite channels. The living room opens directly into a quaint seating area and a dining space where you can gather over a meal. 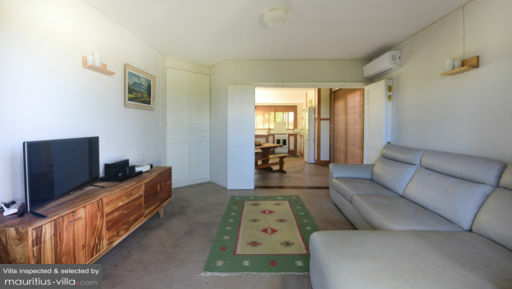 Because Beau Séjour is entirely self-catering, you will find an assortment of appliances and equipment in the kitchen, providing you with the freedom to tuck into a delicious homemade meal whenever you want. Among the various items are wine glasses, kitchenware, oven, tumble dryer, coffee machine, electric kettle, dishwasher and more. Don’t worry about tidying up after yourself thanks to the housekeeping services. However, this service is at an additional cost. 24-hour security is available, as is a gardener who will ensure that the grounds remain as pristine as ever. Upon request and for an extra fee, it is also possible to reserve the services of a personal guest assistant. The village of Pointe d’Esny is an excellent jumping point to the nearby Ile aux Aigrettes islet, home to an extensive number of rare birds and species. Nearby, you will also find that the popular Blue Bay Public Beach offers an assortment of nautical activities such as speedboat rides, glass bottom boats, kayaking, sea-karting, parasailing and more. Should you wish to experience Mauritian cuisine at its finest, don’t hesitate to check out the many small scale, family-owned restaurants in Pointe d’Esny.